Sleeps 4. Queen-size bed, two twin beds, and futon in living room. Blankets and pillows included. I have loved coming to Cape Cod since my childhood. Now I get to share that love with my family. 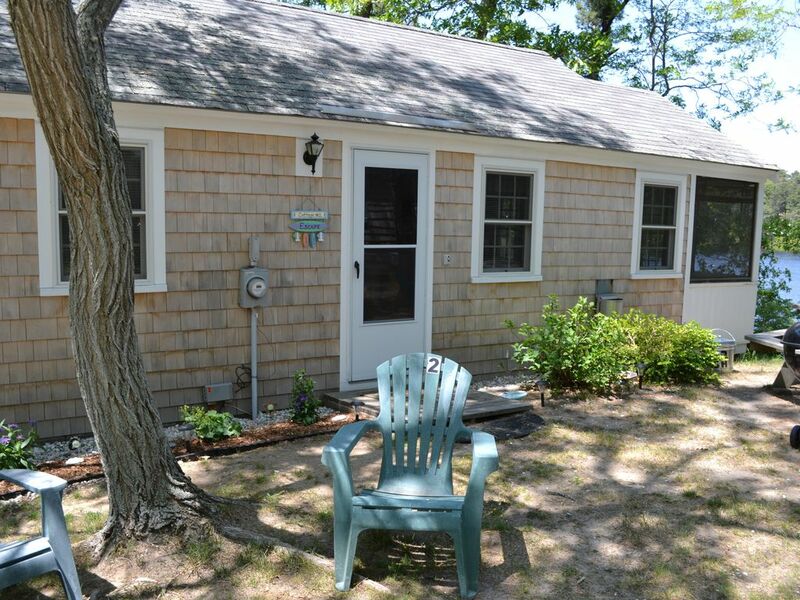 We loved to "Escape" to the Cape & our Nauset Haven cottage! We loved this cottage, right on Minister's Pond. Having the private beach, rowboats, and swimming docks were the perfect bonus feature. We knew our family would enjoy many wonderful vacations here when we first stepped into the cottage. Eastham was the perfect location with all that it offers: Cape Cod National Seashore, including one of the Top Ten Beaches - Coast Guard Beach, the Bayside beaches which have been perfect with a young family, the Cape Cod Rail Trail, and more! Nauset Haven is a wonderful vacation spot. Wake up to a waterfront view, enjoy the lovely views from the screened-in porch, and spend time at the private beach and swimming/boat docks. The boys love the fishing and I love reading on the porch. It truly is our "Escape." Part of the Nauset Haven community, “Escape” is located on the shores of Minister’s Pond, a 21-acre freshwater kettle pond. A private sandy beach on Minister’s Pond is only steps away. Life jackets are available for use of our guests. Centrally located to many vacation activities in Eastham. The Cape Cod National Seashore beaches and the family-friendly Bayside beaches are minutes away. The Cape Cod Rail Trail is a quarter-mile away. Enjoy a Cape Cod Baseball League game in nearby Orleans or a whale watch out of Provincetown, only 20 minutes away. Had a wonderful time at Escape! Escape was exactly as described. Had a wonderful time here for our long, getaway weekend! Had a lovely stay at the cottage on Minister Pond. Though small, it was a perfect size for our 3 person group. It was so nice to be able to jump right into the pond after a long day on the beach or a run. It's also extremely well located--very close to Wellfleet town center and other yummy spots. Will definitely return! We really enjoyed our week in this lovely little cottage. The screened-in porch was wonderful for relaxing at the end of the day. There was such a pretty view of the pond. Couldn't have asked for a better spot to spend a quiet week in mid-June. Cottage was cozy and in a beautiful spot overlooking the pond. We sat out on the terrace in the mornings and evenings soaking up the serenity of the place. Also, very easy to use as a hub to visit P-town, Wellfleet, beaches etc. Worked perfectly for a young family - we put our 8 month year old down in the twin bedroom in a travel cot, and she loved it! Luke - so glad our cottage was a good fit for your family! One of our favorite spots is the screened in porch overlooking the pond as well! Perfect for our family of four! This was the perfect Escape for our family! Eastham was a nice base on the Cape, and this lovely cottage was quiet and comfortable. Caroline is the perfect hostess, offering travel tips and advice. The cottage is very clean, the beds are super comfortable, and that screened porch is the ideal place to enjoy morning coffee while hearing the rooster crow from across the pond. (Don't worry, he won't wake you up!) I would love to come back here! Thanks so much Annie! We love hearing people enjoyed their stay at our Cape Cod "Escape"! We strive to ensure our guests have a clean, homey spot to relax in during their vacation.